Last year when Denise and I visited relatives in Kansas City, Missouri, we were treated with a great tour of downtown. There were so many interesting things to do and see. One of the finest museums that I’ve ever visited is prominent in the landscape. 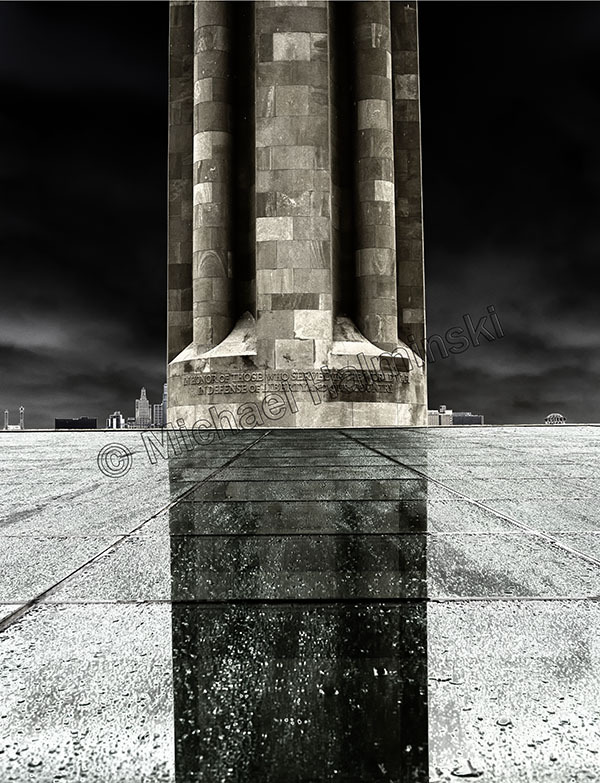 The National World War I Museum was opened in 1926 and features a 265 foot stone spire as a tribute to those that served in the First World War. One can spend days, weeks or longer going through the complex. Our second day visit was on a rainy morning and as we went in, I was attracted by the glass ceiling over the lobby entrance, so I went back out in the drizzle and made two exposures over the wet glass panels. 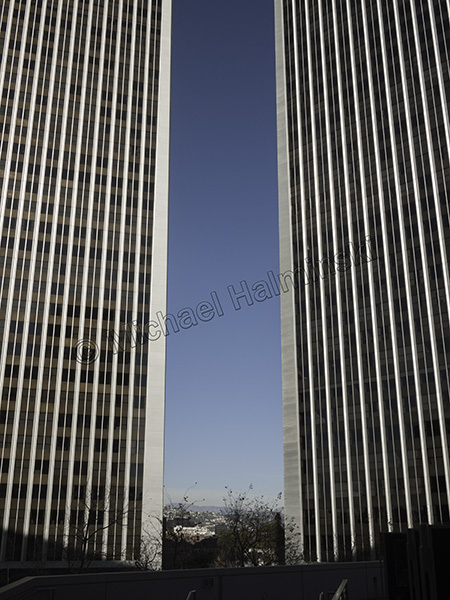 One was vertical and another horizontal. They were quick, handheld shots with my current camera of choice, a Lumix mirrorless body with interchangeable lenses. One of the most prestigious local art shows here is the annual Frank Stick Memorial Art Show hosted by the Dare County Arts Council. It began 41 years ago and I’ve entered a piece in nearly every one. This year I decided to print the above mentioned photograph and apply an age old photo technique. I remembered experimenting with solarized prints in my darkroom around 1980 and the results were usually surreal and unpredictable. Tones are often reversed resembling a negative. 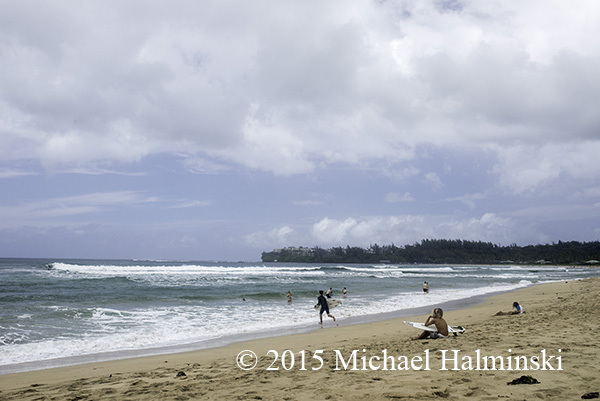 Photoshop made this easy to accomplish and turned a drab day into one looming and dramatic. I entered a 16×20 print and was given an Excellence Award. There were over a hundred entries and ribbons for me have been rare in this venue. This year’s show was poignant in that it was dedicated to my friend and prolific Nags Head artist Glenn Eure who passed away last September at the age of 86. He was a well-known and gifted artist. A Purple Heart recipient, he served combat tours in Korea and Viet Nam. 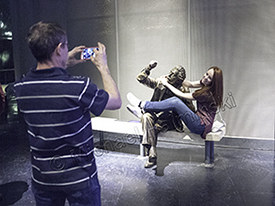 I think he would have liked my print entitled TRIBUTE IN KC. This entry was posted in buildings, history, military, travel on January 28, 2019 by j0jgvm89bj. 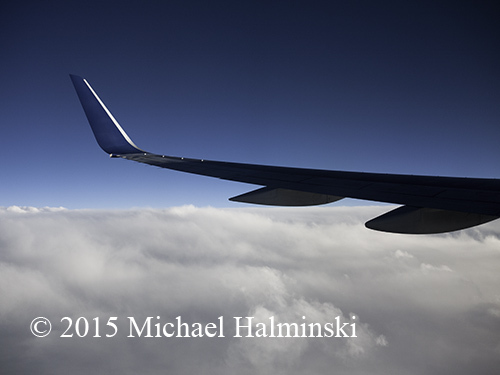 Earlier this month, Denise and I took a flight to Los Angeles for a short visit with relatives. It was meaningful for me in that my family has had roots in LA for generations. My dad was one of 3 sons born to Polish immigrants that settled in South Pasadena about 1920. My mother’s family goes back much further with lineage going back several generations with American-Mexican roots. I was born in Pasadena and remember riding in an old Ford, driving by lots of oil wells and orange groves. There was traffic on the freeways then, but nothing like it is today. I was nonetheless, excited to go back. It had been nearly 30 years since my last visit. 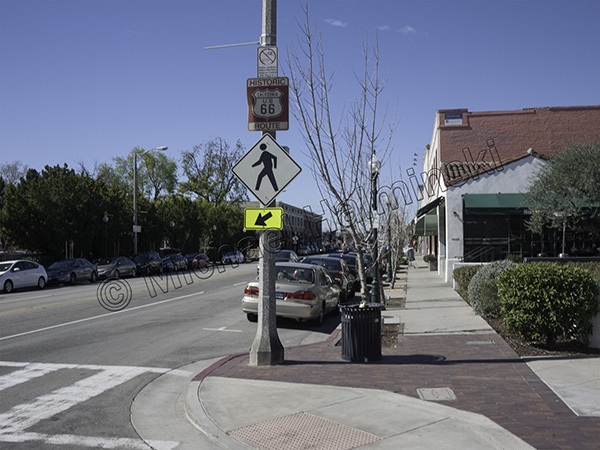 Spellbound by the urban environment, my first shot was taken in Studio City. 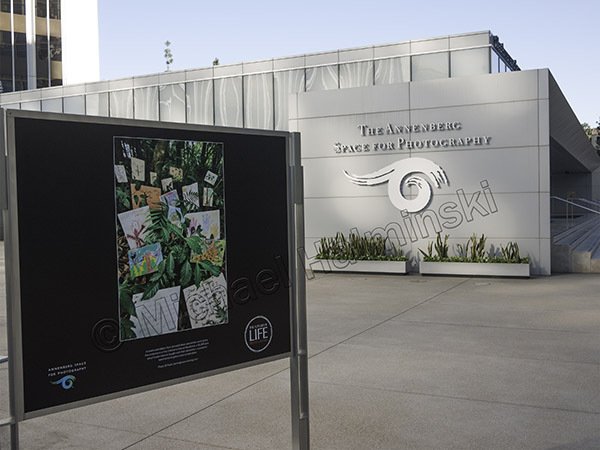 Nearby, The Annenberg Space for Photography was showing a major exhibit by Franz Lanting, one of my favorite photographers. 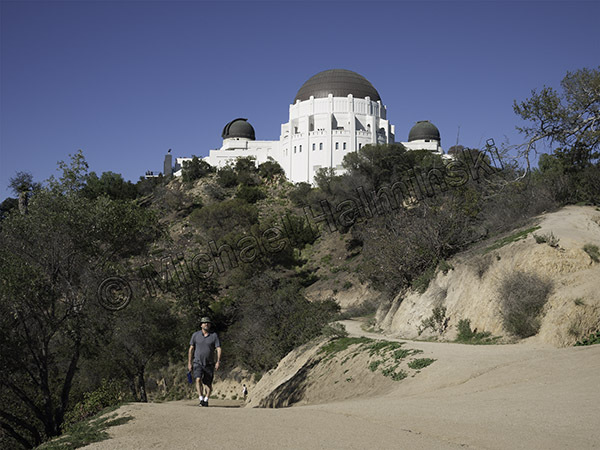 With so much to see, we took in a few attractions, beginning with the Griffith Observatory. Hiking trails are all around the property. The exhibits inside were stunning, interactive and free. 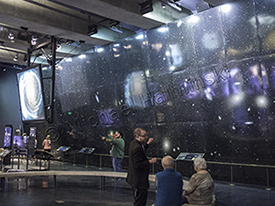 The Big Picture of the universe is 20 feet high and 152 feet long, while the bronze statue of Einstein is a hit with visitors. Perched high on the mountain, I could see for miles. 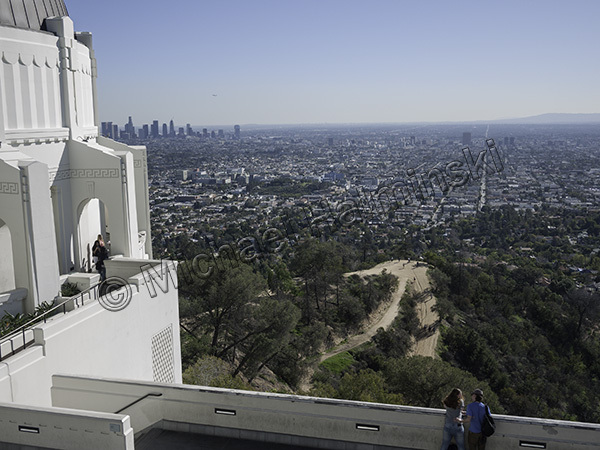 Tourists lined up to have their pictures taken with the Hollywood sign as a backdrop. 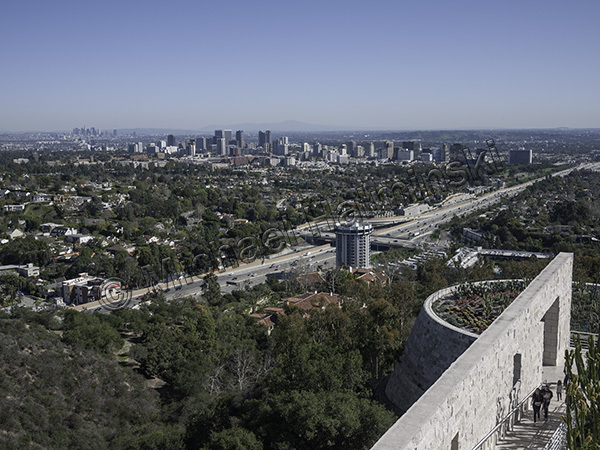 The overview of LA from the Getty Museum was also impressive, the art exhibits spectacular. You could spend countless hours there. 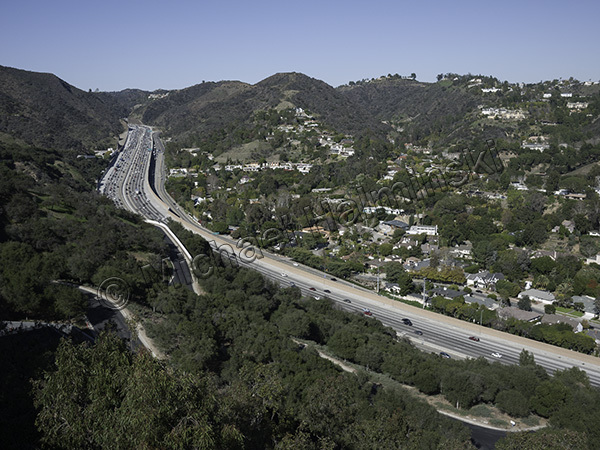 The San Diego Freeway passes next to the Getty, through Sepulvida Pass and the Santa Monica Mountains. 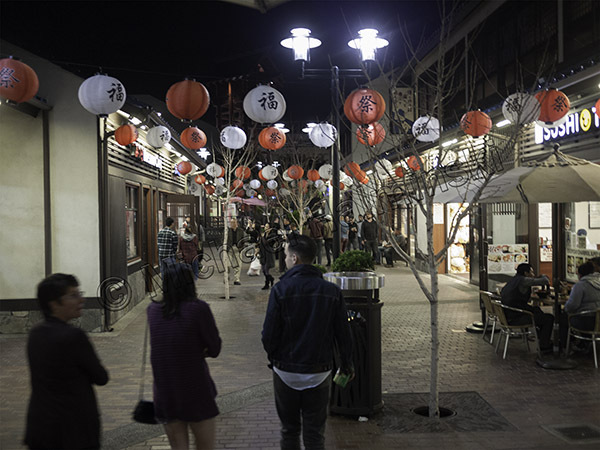 Little Tokyo was beautiful at night, especially with the lure of Japanese restaurants. 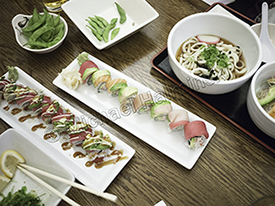 I found the sushi irresistible. My cousin John, invited us out to Wonder Valley in the desert next to Joshua Tree. The feeling there was one of awe, inspiration and isolation. 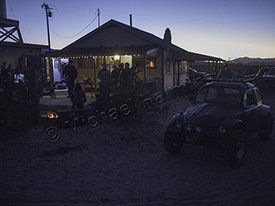 John’s Baja Bug was a lot of fun off the road. Some of the desert rats even showed up. 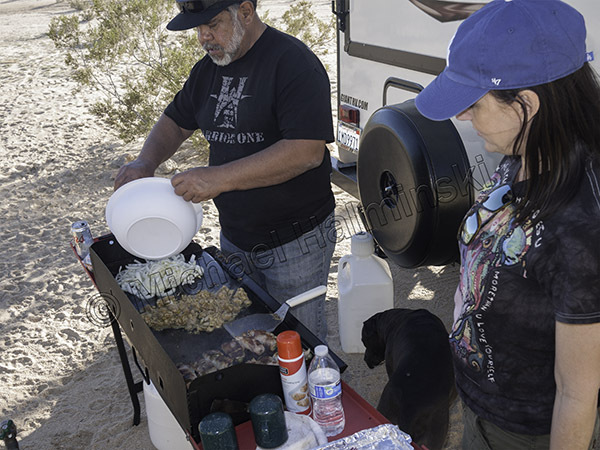 Ray loves to cook and prepared delectable tacos on his portable grill. 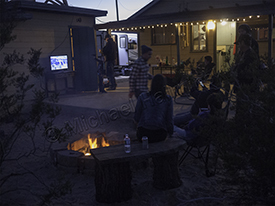 We had a Superbowl party at John’s desert cabin, with crystal clear reception on an outside TV under a crystal clear sky. The highlight of the trip was visiting Mission Street in South Pasadena. It still has a small town feeling, much like when I was little. 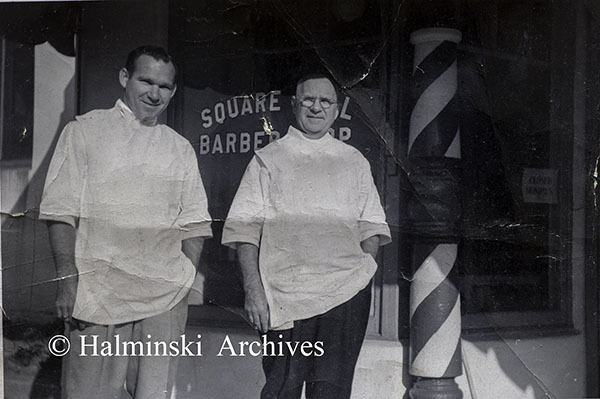 My grandfather William, opened the Square Deal Barbershop on Mission Street in 1924. He worked there the rest of his life, passing it on to his son, my Uncle Eddie. Likewise, Eddie continued to cut hair the rest of his career, leaving it to his son John, who now leases it to another barber. The old photograph of Eddie and grandpa was likely taken in the forties. 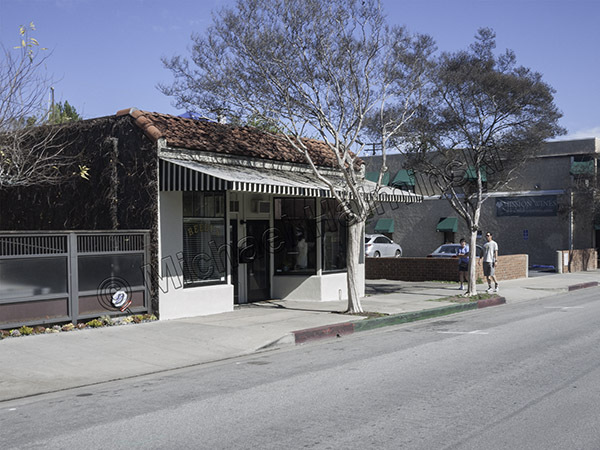 Today the barbershop is called Reedy’s, and still has a clean, welcoming appearance. Inside we met barber Steve Reedy with Frank Reader, a regular customer and talented lead singer for the popular Scottish band, Trashcan Sinatras. 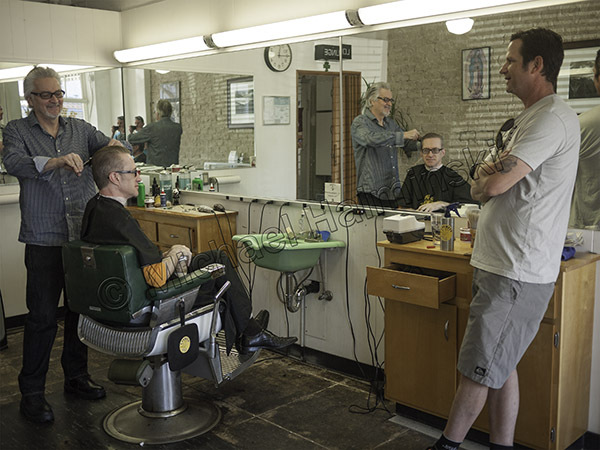 It was wonderful to see Steve carry on the tradition of cutting hair in that very same spot. And to think grandpa gave me my first haircut right there. Can you imagine the conversations in that building over the past 92 years? 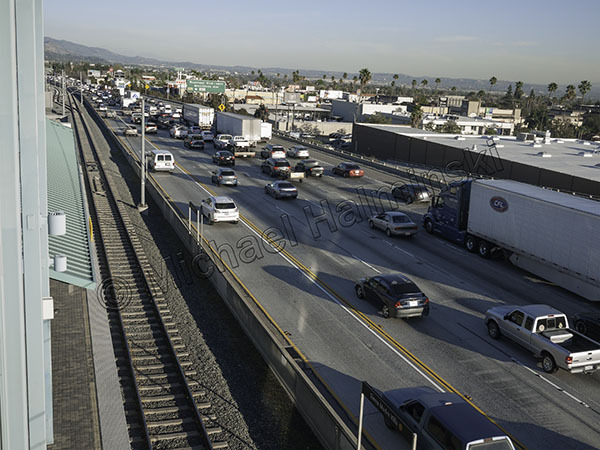 Despite the constant heavy traffic, I’d go back in a heartbeat, provided someone else drives or takes me on the Metro train. 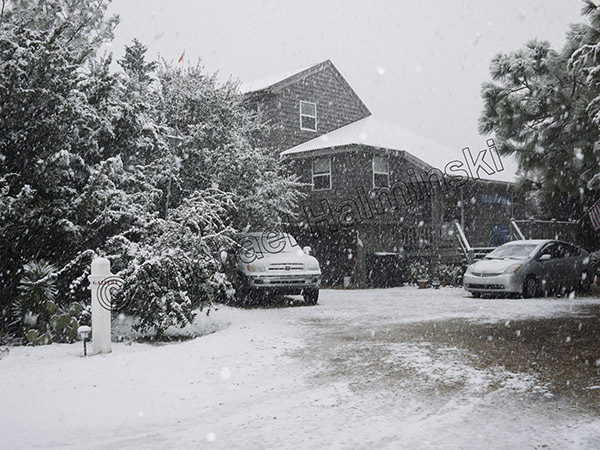 We arrived back on Hatteras just in time for a snowstorm, a surprising contrast to the warm California sun. This entry was posted in travel on February 24, 2016 by j0jgvm89bj. What seemed a scavenger hunt, we knew we were headed in the right direction. 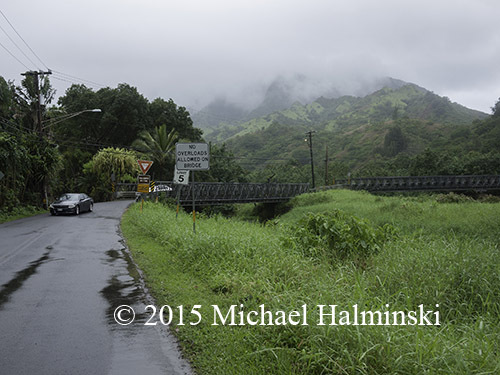 Journal entries confirmed a place at the end of the road, near Ke’e Beach. 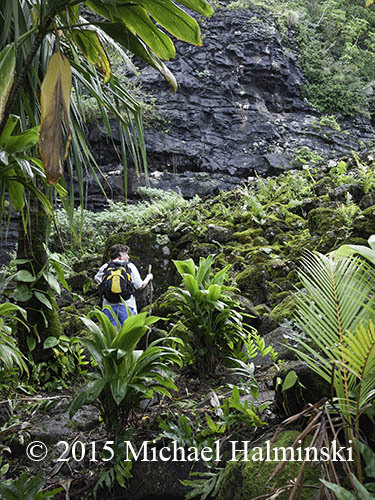 There were references to an area revered by Hawaiians. 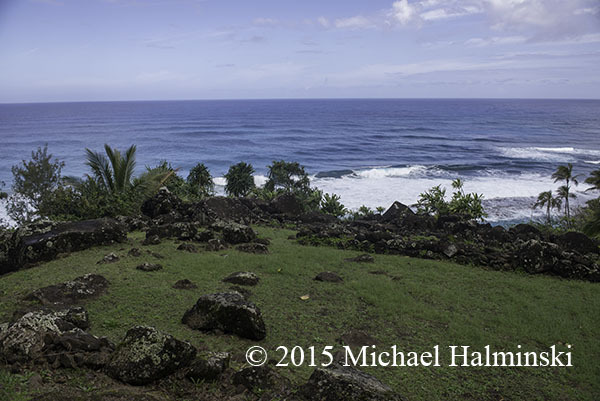 Known as a Heiau (hey ow), locals told us it was next to the trailhead for the Na Pali Coast, at end of the road. Robin’s leather-bound journal from 2010 was the key. 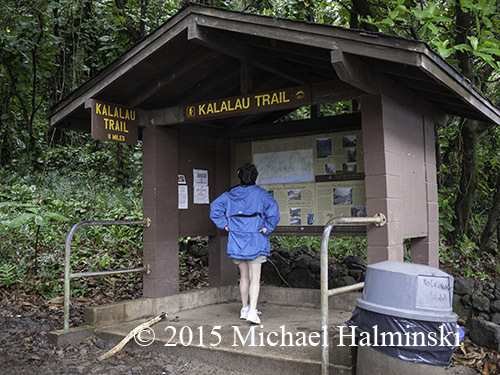 The trail entrance to Na Pali is at the end of the road. 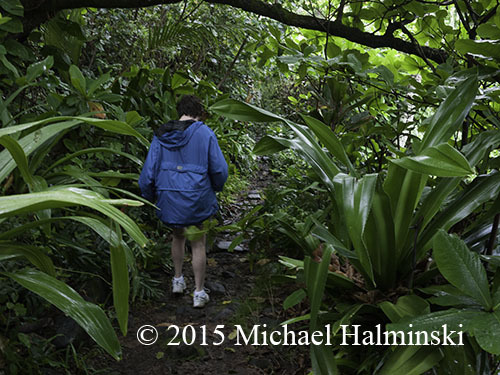 We found an overgrown path and walked through lush vegetation. Approaching a rock wall, I felt elation, and knew this was the right place. 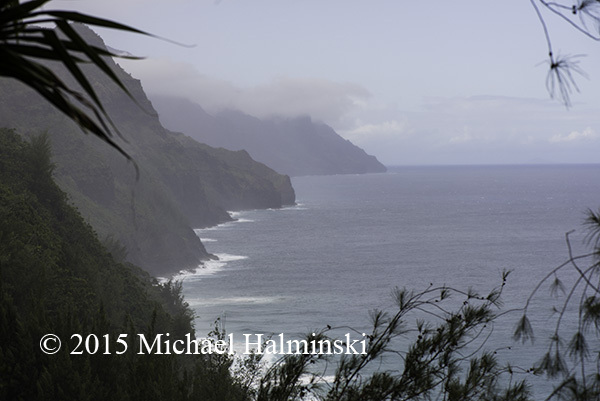 The view was remarkable and whales spouted offshore. What an affirmation! Robin’s descriptions, photos and journal entries were a perfect match. 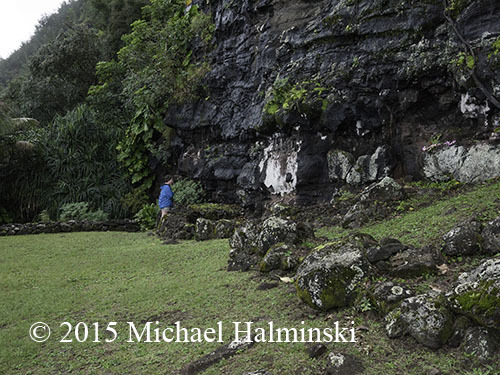 Stones were laid in an orderly fashion by ancient Hawaiians. 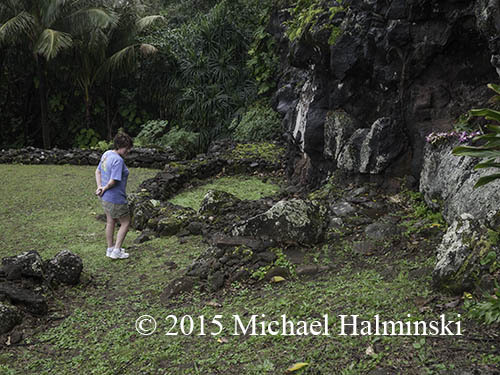 The site was a temple and served as a school for the Hula. Students would come from surrounding islands. 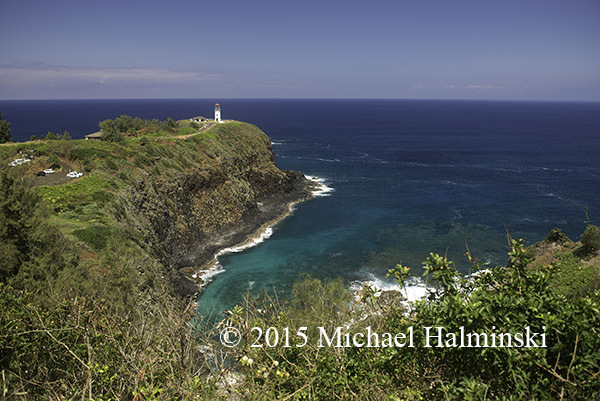 It is said that the goddess Pele came here from the big island after hearing the drum beats. I tried to imagine what was here hundreds of years ago. 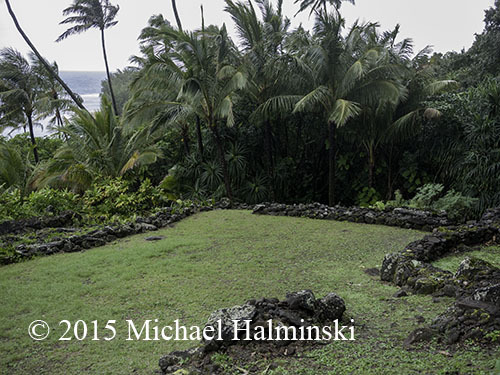 There could have been thatched structures and large carved Tikis. 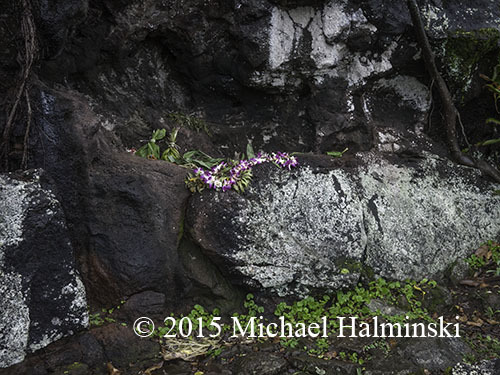 A shelf in the rock wall looked like an altar where ceremonies could have taken place. Someone left offerings wrapped in Ti leaves and a beautiful flowered lei. 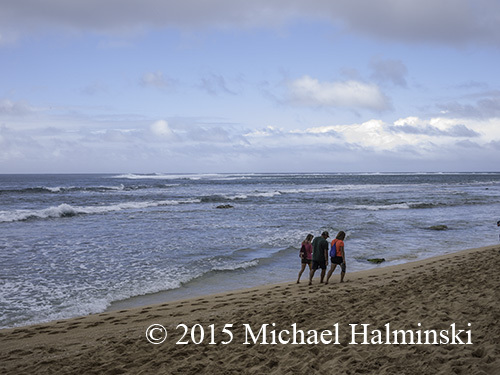 After finding the location of the Heiau, we explored the beach at Ke’e. 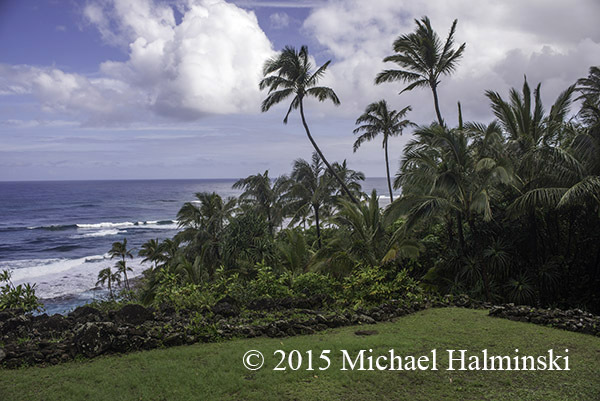 Ha’ena State Park is next to Ke’e. 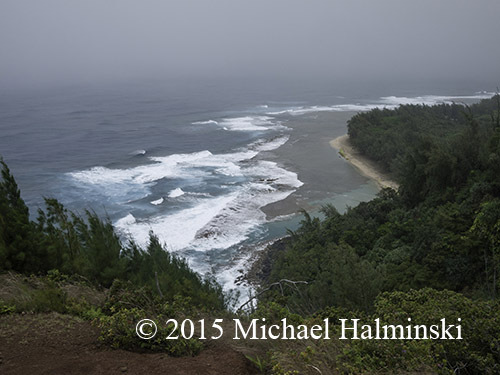 The waves at Tunnels were big and breaking on the distant reef. 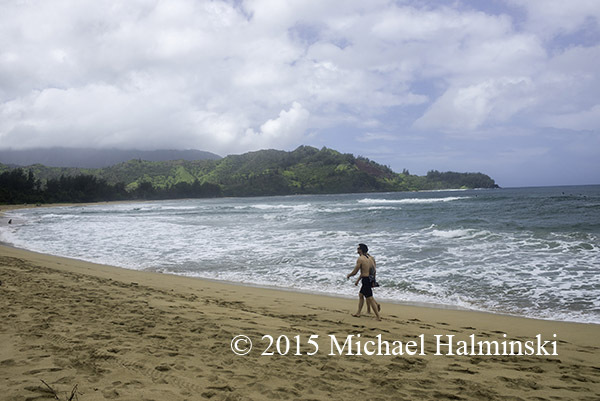 We spent some time on the wide crescent beach at Hanalei. 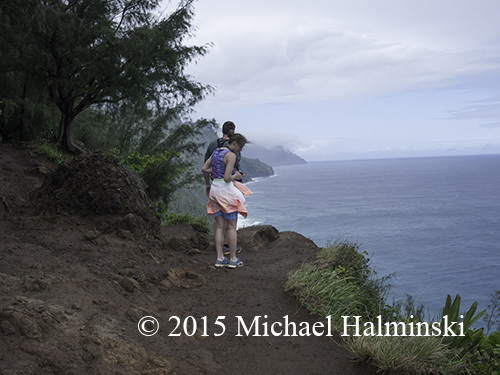 The following day we began hiking the Kalalau Trail. 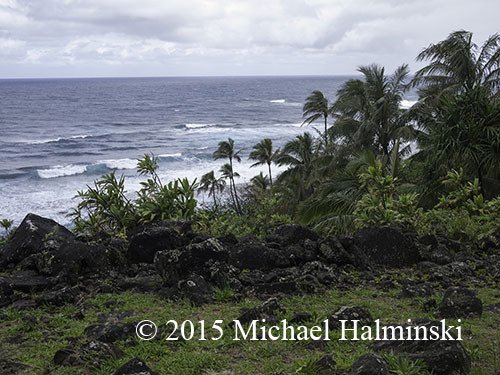 The first overlook gave a spectacular view of Ke’e Beach. 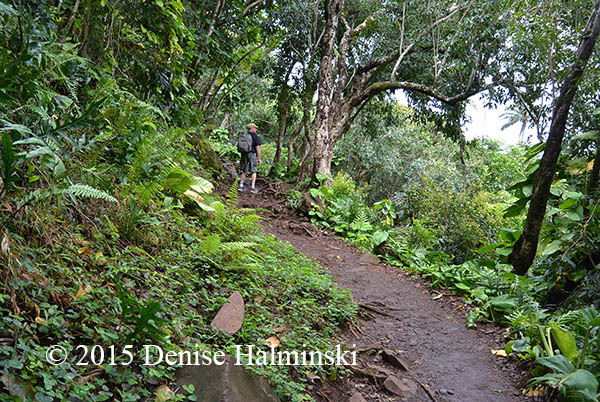 At times the steep drop-offs were precariously close to the trail. In a heavy downpour it got so muddy, we had to turn back after going in ¾ mile. 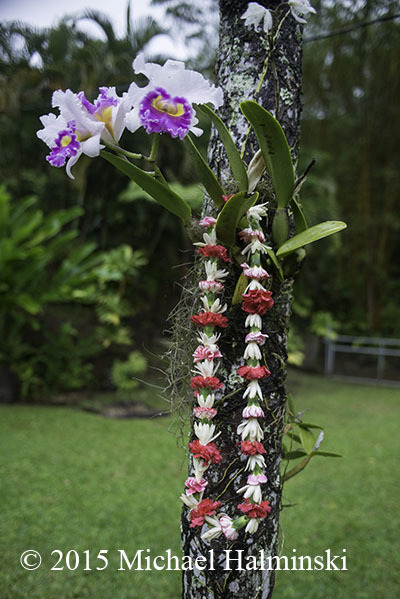 On the way back to our cottage, a man on the roadside sold us a lei made by his wife. 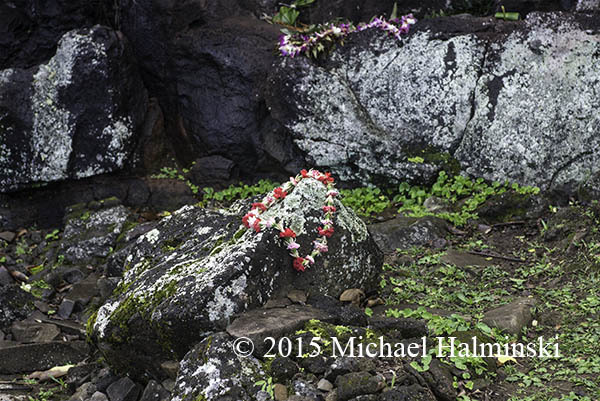 Early next morning we went to the Heiau with Robin’s ashes. 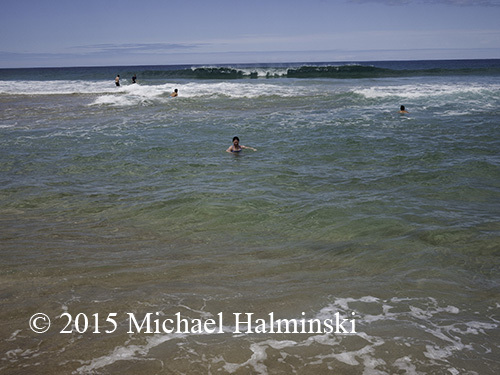 It was a spectacular day, and a few whales breached from the ocean. 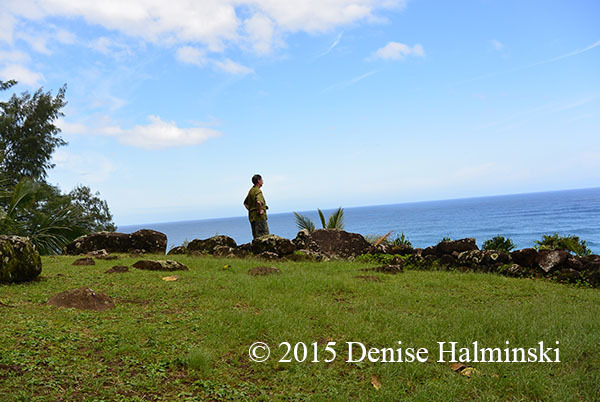 We spent an hour contemplating the moment, and the sacredness of the site. 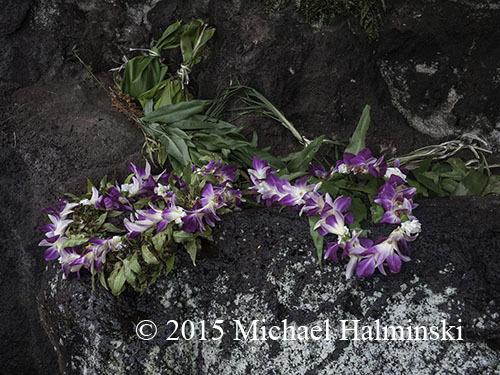 We placed the ashes up against a sheer rock wall, splashed an offering of Hawaiian rum and presented the lei. 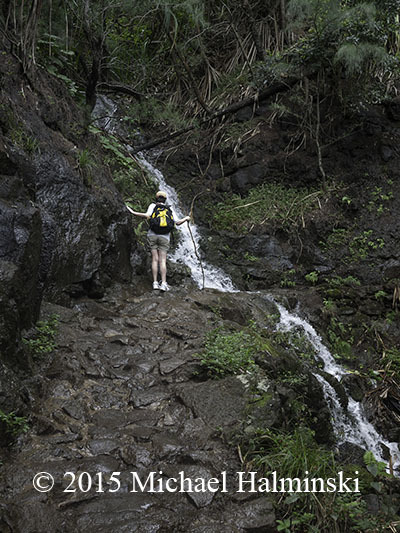 This entry was posted in People, Sea, travel on May 11, 2015 by j0jgvm89bj. In the Fall of 2013, I did some blogging about Robin. He had a rich life but now is gone. We said our goodbyes and have had lots of time to reflect. Robin had directives in place to disperse his possessions. But there was also a last request. 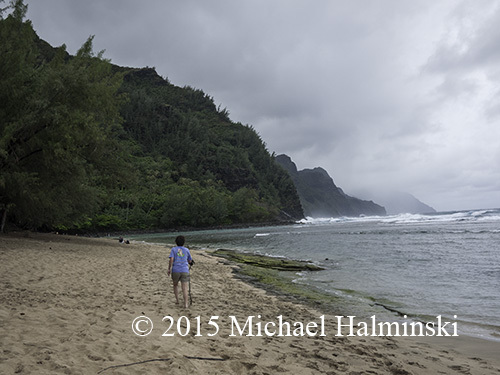 He wanted his ashes taken to the island of Kauai. 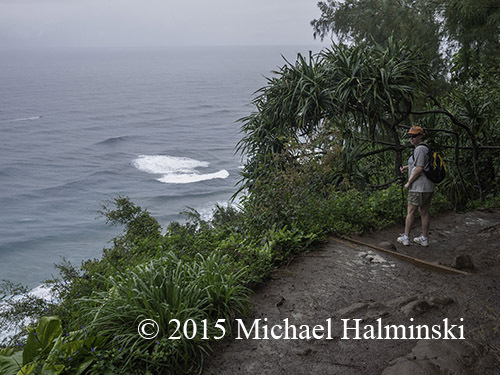 After he lost his wife Carey, to cancer, he returned to Kauai in 2010 to scatter her remains. Years prior, they made a number of trips to the island. 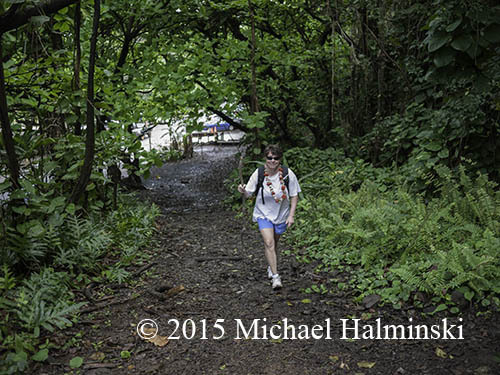 Carey worked as a nurse at the hospital in Lihue and went again in 1993, after Hurricane Inniki ravaged the island. They were both very fond of the place and told captivating stories about it. Robin wanted his final wish to be carried out by me and Denise. His directions where to go, were not crystal clear. As clues, there were vague vocal descriptions about “the end of the road”. 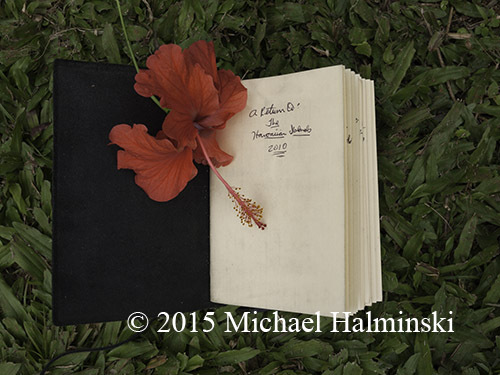 There were also some photographs and a journal that we used, to narrow down the possibilities. 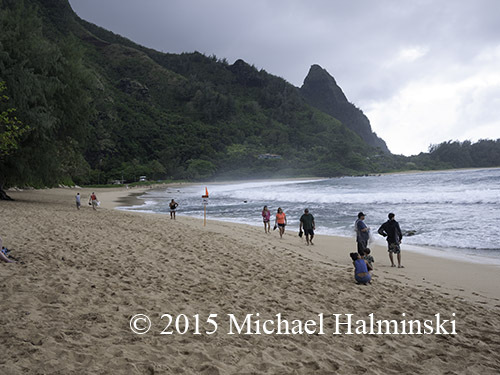 In March we embarked on a journey that ultimately took us to the North Shore of Kauai to carry out our calling. It was an introduction to a gorgeous part of the world. And for me personally, it was inspiration to remember a friend and revitalize my photography. 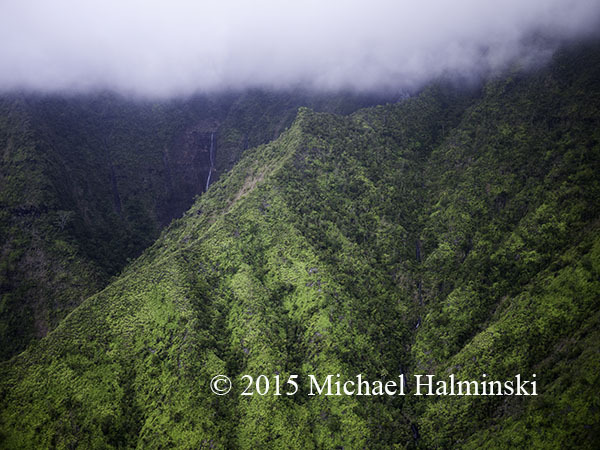 Reality didn’t set in until I was cruising high over the Pacific Ocean bound for Kauai. 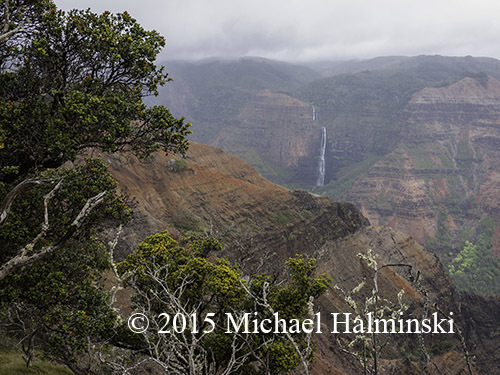 The next day I was standing on the edge of Waimea Canyon. 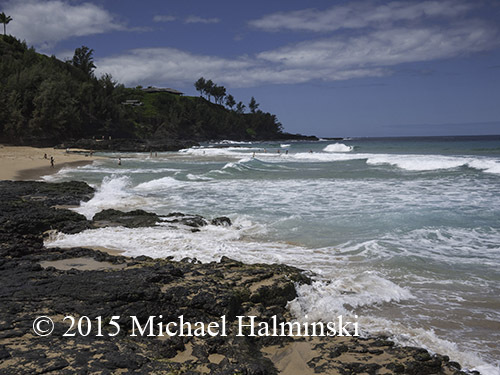 We spent some time exploring beaches around Kilauea. 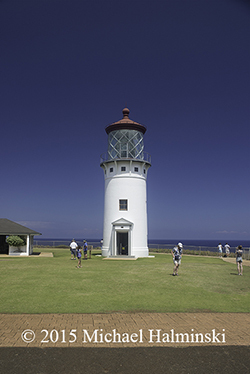 Kilauea Point is a National Wildlife Refuge with a lighthouse on it. 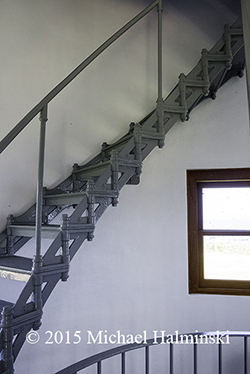 Originally built in 1912, it was recently restored. 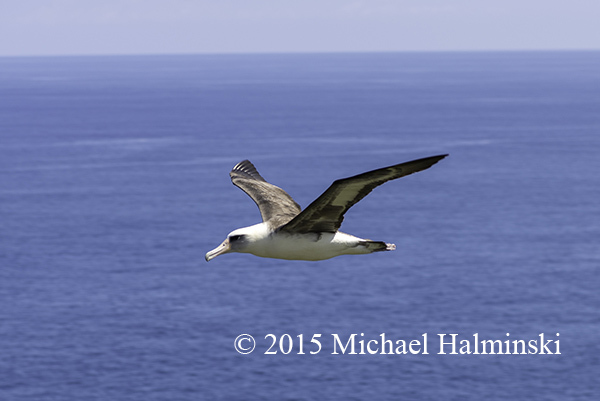 There were sea birds like this Laysan Albatross nesting in the surrounding cliffs. 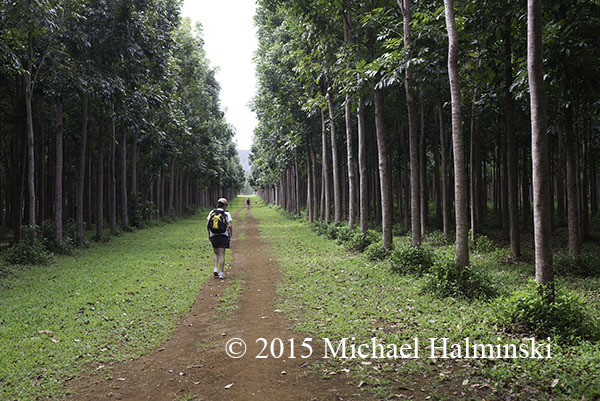 We hiked through a farm with 40,000 mahogany trees on it. 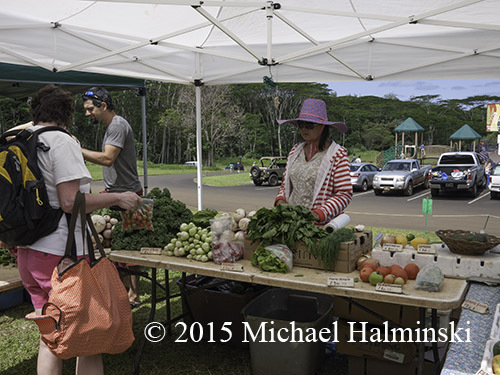 And we loved the local farmers market on Saturday. 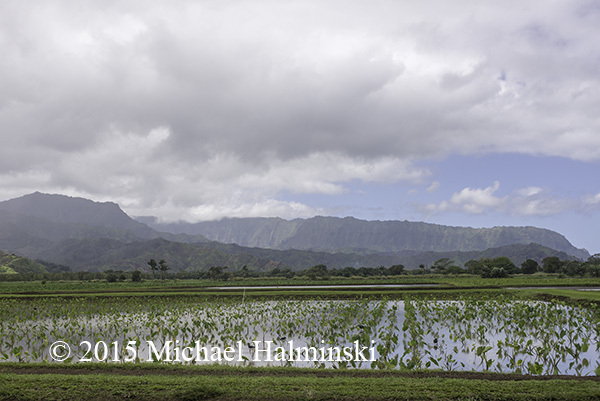 We saw how taro plants growing in Hanalei Valley provide critical waterfowl habitat. 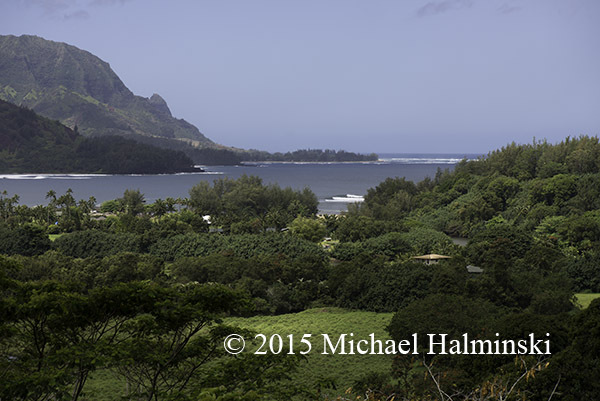 Perfect waves at Hanalei were visible from an overlook a mile away. 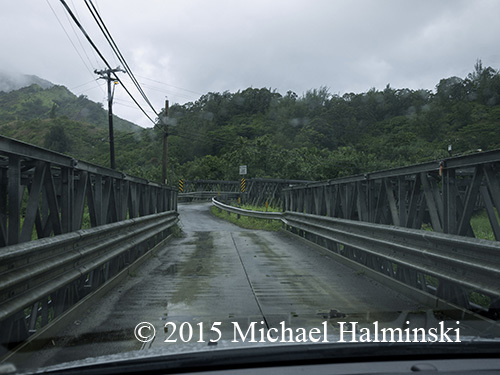 The single lane, double bridge going over the Wainiha River would eventually take us where we needed to go. 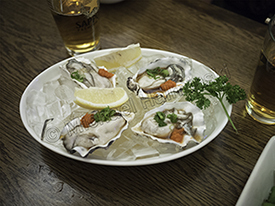 This entry was posted in Sea, travel on May 4, 2015 by j0jgvm89bj. At times I’ve thought I live in one of the wettest places on the planet. That’s when we have flooding from storm surges, and not so much from rainfall. 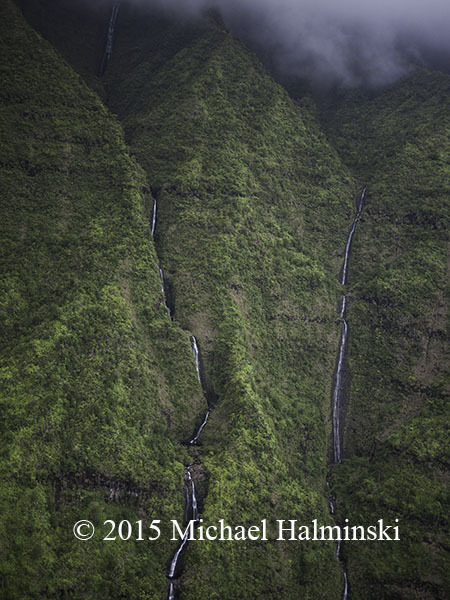 With over 450 inches of measured annual rainfall, a place I visited recently is arguably the wettest place on earth. There was a good reason to be there and that’s another story. 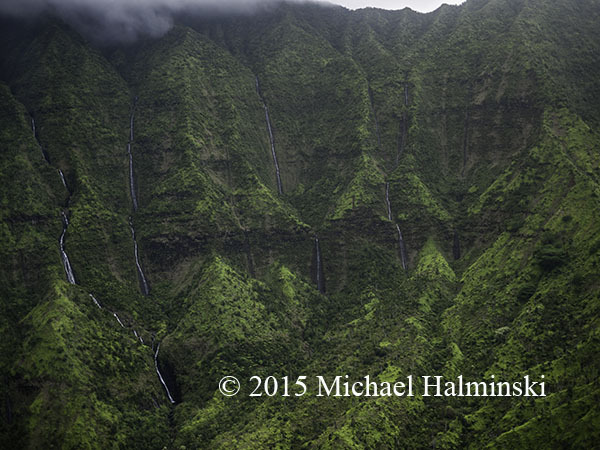 On this trip Denise and I flew in a helicopter around the stunningly scenic island of Kauai. 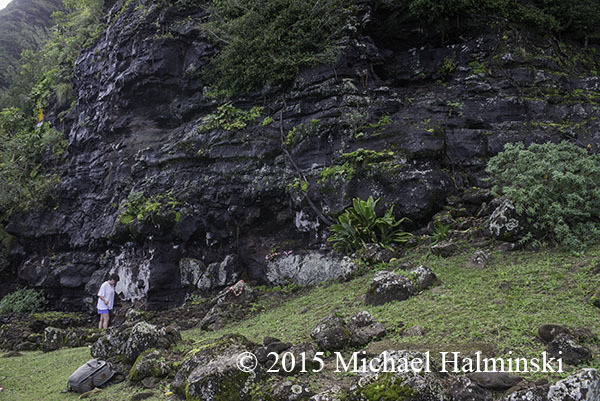 Ben, our pilot took us into the huge three sided crater of Mount Wai’ale’ale’. Billed locally as the wettest spot on earth, there were clouds hovering all around, and we could feel the cool moisture inside the cockpit. Entering the crater was dramatic. Vertical walls were streaming with water. 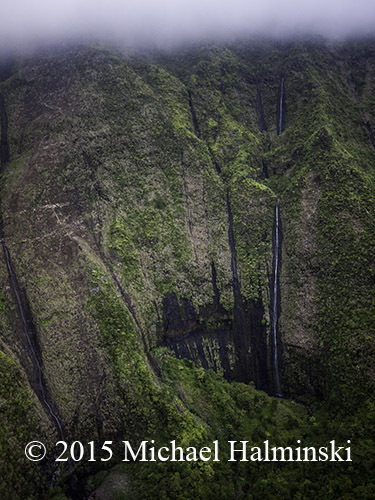 On the side where multiple waterfalls drop thousands of feet, is The Wall of Tears. 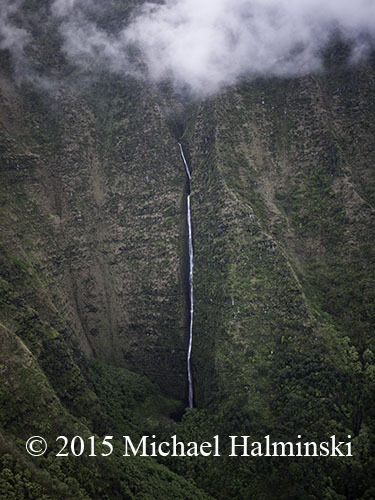 This entry was posted in aerial photography, travel on April 3, 2015 by j0jgvm89bj.